Andhra Pradesh Chief Minister N Chandrababu Naidu made it clear this was only the beginning of the agitation for the protest against the central government's evil attitude.On Friday, a bicycle yatra started from Venkatapalem in Amravati to the state assembly. By driving himself Leading the bicycle rally.He paid tribute to the Nandamuri Tarakarama Rao idol first.Speaking to the people, the Central Government deliberately blocked Andhra Pradesh development and said it was a bad thing.In 1984, when the Prime Minister of Indira Gandhi collapsed with conspiracy to help the NTR government with the help of Nandendla Basker rao Congress,, Resulting in remaking NTR again as chief minister. Chandrababu said that the Congress party was unearthed by Sonia Gandhi to unite the common Andhra state and the Congress party was inundated by the Congress party. The Prime Minister Narendra Modi should not be with the Tamils ​​and warned that the Congress would take the BJP to the BJP. Chandrababu said it was only the beginning of the struggle to launch special status and division guarantees.Farmers said they were generous and voluntary 33,000 acres of land for the construction of the Nawada Capital, the farmers had benefited, and the government also benefited. Some critically criticize the structure of the capital and criticized it as a bad thing.A donation of Rs 5 lakh to the capital structurePrime Minister MODI, has donated Rs 5 lakh check to the Chief Minister for the construction of the capital of Navratra Pradesh. The Chief Minister said that Yogita was a kindly appreciative. The Chief Minister assured people to cooperate generously for the construction of the capital and pay more interest to banks than bonds. 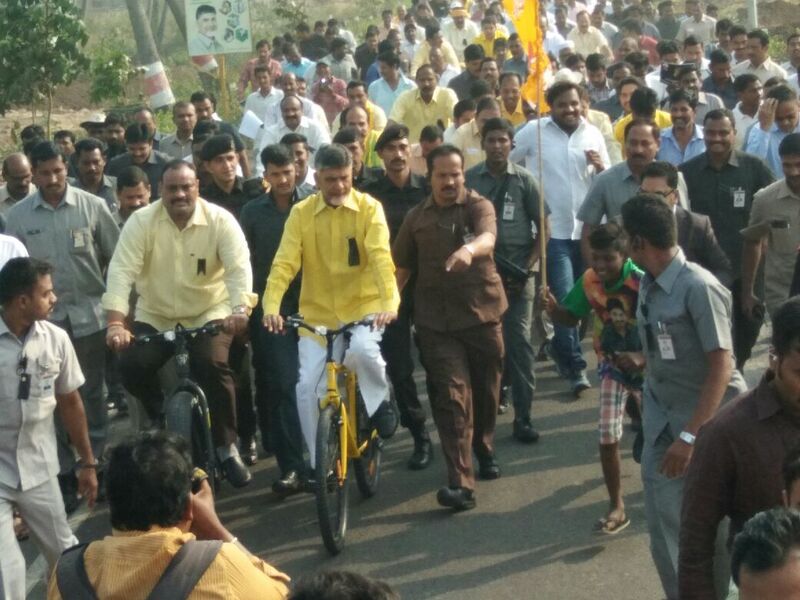 Ministers MLAs and MLCs participated in the bicycle rally held by Chief Minister Chandrababu.